Great Barrington and South Egremont are the antique collectors' towns par excellence. Browsing old stuff in the shops is the daily passion, but several excursions to nature spots provide an antidote to buying-and-selling. If mountain hiking is more to your taste than shopping, head north out of Great Barrington on US 7, and after 4.5 miles (7 km) you'll see signs for Monument Mountain, on the right-hand (west) side of the highway. Follow US 7 south from Great Barrington for about 10 miles, and turn onto MA 7A for Ashley Falls. Your destination, a mile from Ashley Falls along Rannpo and Weatogue roads, is Bartholomew's Cobble, bordering the Housatonic River. A "cobble" in this case is a high knoll of limestone, marble, or quartzite, 500 million years old, and covered with a rich and varied collection of native flora: trees, ferns, mosses, wildflowers. The nature reservation, open year round, is owned by the Trustees of Reservations (tel 413-229-8600), and has 6 miles (10 km) of hiking trails. Another pretty nature nook, good for a picnic, is Bash Bish Falls, 12 miles (19 km) southwest of South Egremont, right on the New York state line in Bash Bish Falls State Park. Follow MA 41 south out of town, and turn right onto Mount Washington Road (look for signs for Catamount ski area). Follow signs to Bash Bish Falls, taking East Street, then West Street, and finally Bash Bish Falls Road, deep in the Mount Washington State Forest. You'll plunge into the valley carved by the Bash Bish Creek, and finally come to a parking area from which a steep trail leads to the falls in 1/3 mile (530 meters). Stay on the road a bit farther and you'll come to another parking place, and an easier—but longer—trail (2/3 mile; 1 km). Stay on the road any longer and you'll end up on NY Route 344 in New York's Taconic State Park. 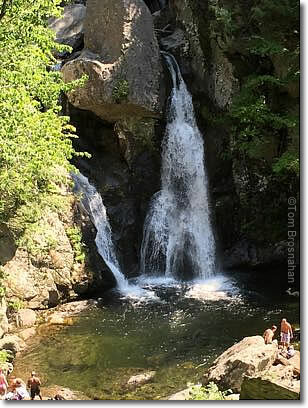 Bash Bish Falls, tallest waterfall in Massachusetts, in the southwest corner of the state. Note the tiny humans in the lower corners for scale.